Happy days are here again. It's holidays and a time when many people will spend money they saved during the year. It's good to buy gifts for loved ones and to celebrate, but people should be careful not to overspend. Spending becomes a problem when children cannot go back to school because parents used all the money for new clothes, gifts and parties or get into debt. Sometimes no money is left for parents' transport to work in the city and to be back home in time. Because this is also a time for temptations, Vuk'uzenzele talked to the South African Savings Institute about overspending. Their motto is 'Make every month savings month.' Their advice to Vuk'uzenzele readers is to think ahead and save, save, save! Change the way you think; don't be comfortable with debt. Make a promise to yourself to be debt free within three, six or 12 months. Pay off debt as soon as you can, but do not borrow money to pay off debt. Avoid opening clothing accounts, it causes unnecessary spending. Draw up a budget, check the budget monthly and watch your spending carefully. January is school expense month; keep money aside from annual bonus or monthly savings for things like school uniforms and books. Make a note of everything you buy. This will show up unnecessary spending. You don't have to be like those people who buy too much. Everybody's needs are different. Shop around before you buy. Compare prices. Remember, it is never too early to start saving for retirement. 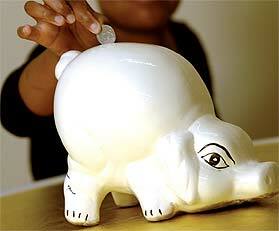 Get a money box and save money that you would have spent on lottery, cigarettes etc. Teach your children to save from an early age. Start a savings club with some friends, family or colleagues. Expensive gifts are often unnecessary. Rather find out what someone really needs and buy a less expensive, useful gift. Think of three expensive things that you can cut down immediately and use the money for something useful. Encourage members of your group to put aside some of the money they would use for year-end-parties for something like paying school fees up front. If the money is being used for groceries, buy together in bulk and share the goods rather than splitting the money first.